Some are claiming that researchers have taken a step toward showing how life could arise from non-life. Bible-believing Christians in the United Kingdom are lamenting the loss of more religious liberties. Christians can rejoice that more people are reading Genesis’s historical account of the Flood and seeing the true character of the Creator. 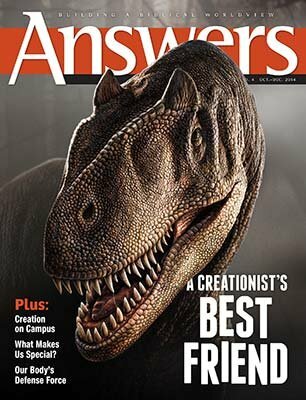 It doesn’t take much to understand why creationists love dinosaurs. The God of creation owns it all and He wins! “Little Foot” is an australopithecine (southern ape), the most complete specimen yet discovered, and some say the oldest. The next Bible-themed Hollywood blockbuster, Exodus: Gods and Kings, is scheduled to come out in December. Creationists point out that shared biological structures are the common designs we would expect from our common Designer.